The Cactus wren (Campylorhynchus brunneicapillus) has a white eye stripe just behind each eye extending to just before its upper back. Its throat and breast are heavily spotted dark brown and black, and its wings and tail are barred with black, white and brown feathers. Its overall appearance is a creamy colored brown bird with varied black and white patterns covering its body. Its beak is slightly curved. 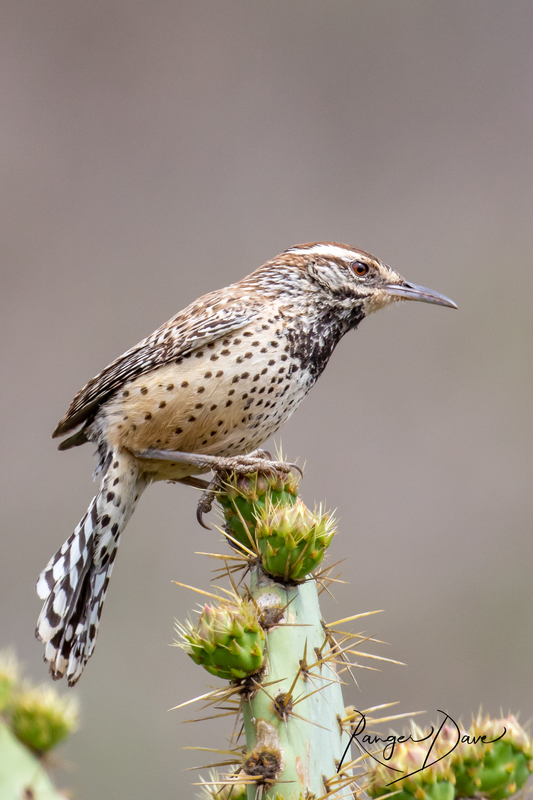 The coastal cactus wren is found only in Southern California. Unfortunately, wren populations are declining and becoming more fragmented as a result of the loss and degradation of cactus scrub habitat. San Pasqual Valley and Lake Hodges area possesses some of the most intact cactus scrub in Southern California and supports the majority of the remaining wrens in San Diego County. Because these birds require stands of healthy cactus for nesting, their survival hinges on the health of their shrinking habitat. Over the last decade or so, large intense fires have damaged coastal cactus wren habitat in San Diego County. Since the time I have worked at the River Park (about 20 years now) we have been trying to recreate this crucial habitat in hopes that more wren reproduce and stay in the area. Year after year we have planted hundreds of cactus much to the anguish of mine and many volunteers fingers. We have successfully created new cactus stands in San Pasqual Valley and on the northern edges of Lake Hodges. It’s always a treat to see them moving gracefully through an otherwise not so kind environment.